Do you still watch those old horse movies that you've seen a dozen times, just for the scenes of the horse galloping in slow motion? Do you hold your breath just a bit? It's because horses embody so much more than muscle and bone. They evoke a full range of emotions like hope and courage and valor. They can gallop straight to you with neck arched and tail flagged, and then instantly melt to a stop--just to share your breath. We've been besotted with horses since they had three toes. From the popular Relaxed and Forward blog comes training advice combining the everyday fundamentals of dressage with mutual listening skills. 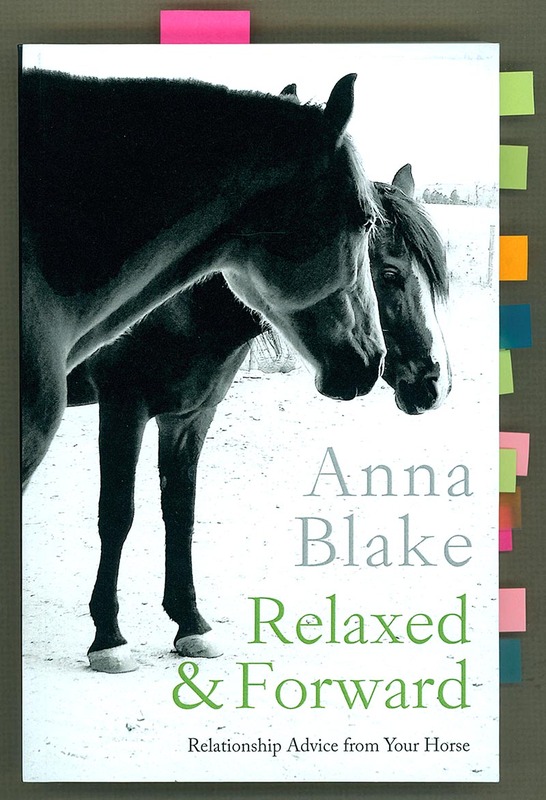 Blake writes with a profound respect for horses and an articulate voice for humans, blending equal parts inspiration and un-common sense. It's serious training communicated with humor and lightness, because horses like cheerful riders. Most riders want to build a better relationship with their horse. These short essays are geared as much toward encouraging a positive training attitude as useful technique. Blake's writing uses clear descriptions, storytelling, and humor to inspire meaningful, positive communication. Less correction and more direction. Horses are honest; they answer us in kind. If we want a better response, a more fluid conversation and relationship with a horse, riders have to be the ones to change first. The other word for that is leadership. Gina's note: Normally I feature a nice scan of a book's cover, so folks can see it in it's pristine glory. But this time is different. The cover picture you see here is my personal copy, with all the Post-it flags left in place so you can see just how much noteworthy content is in this gem of a book. Anna has a way with words; she can take a powerful, complex concept and distill it down to a memorable, eloquent sentence or two without losing any of the meaning. Horses give us calming signals, just like dogs. Norwegian dog trainer and behaviorist Turid Rugaas wrote about it in 2005. She coined the phrase calming signals to describe the social skills, or body language, that dogs use to avoid conflict, invite play, and communicate a wide range of information to other dogs. Calming signals in horses are somewhat similar and include looking away, having lateral ears, yawning, stretching down, licking lips or eating to calm themselves. Can you recognize them? Calming cues communicate stress, and at the same time, release stress. It is modeling behavior for us; they want us to lower our stress level, or aggressiveness as well. When a horse looks away, either with his eyes or whole head and neck, it is a calming cue. He uses a signal like this when he feels pressured and wants the rider to know he senses the person’s agitation or aggression, but that person can calm down because he is no threat to the human. In the horse’s mind, he is communicating clearly and with respect. Do you pull his head back and force his position? It’s human nature to turn up our volume if we think we aren’t being heard and maybe the hardest thing about listening to calming signals is that they kind of poke our dominant parts. So when the horse signals us to be less aggressive, but we mistakenly hear it as boredom or distraction or even disobedience, and then follow that up with a larger cue, we’re starting a fight. We’re letting the horse know we choose aggression over peace. Is that what you meant to say? Or is the appropriate positive response from a good leader to de-escalate the situation? If riders want to understand the language of horses, we need stop seeing our horses in our own worst image (lazy or distracted) and begin a conversation where we listen more openly, more honestly. It’s much too simplistic to lump everything a horse does into either dominant or submissive behavior. Herd life has much more nuance than that. As social animals, they work to get along, encouraging others to cooperate. Even dominant boss mares give calming cues. We can build trust with the horse if we learn to respect calming signals, and even reward them. In my training, the best calming signal I have is my breath. I can slow it down, emphasize the exhale, and just be still at the end. Using our breath is a huge aid that horses pay attention to, so much more than humans realize. Each time I start work with a horse, I ask for his eye, using my eye. I want him to volunteer. If my horse looks away, I take a deep breath, acknowledge the moment, and go slow. Usually on my second or third breath, he’ll look back and tell me he’s ready. It’s a short wait, compared to putting fear or resistance in that eye. Reading horse body language takes some quiet time to learn, and they aren’t all exactly alike. Some horses are so shut down, so overwhelmed by us pounding on them in the past, that they have no calming cues at all, but you can remind him. Calming is a good thing, no matter who cues it. If you are thinking of tuning up your communication skills with your horse, I really recommend ground work. It’s my favorite thing about the Horse Agility we do here at Infinity Farm in the summer. Obstacles are great conversation starters with a horse, and if the human can get past needing to dominate the obstacle, communication can be eloquent, with understanding and a healthy give-and-take reasoning. And it all translates to the saddle later. Now that I think about it, when I meet someone who is loud or aggressive, I tend to look away, too. Sometimes I turn my shoulders sideways and don’t make eye contact. I notice I don’t like aggressive people crowding me and talking loud either. This is about the time I become aware that I do groundwork with humans as often as I do horses. Maybe the real reason we shouldn’t humanize horses is because they had it right in the first place.